Every month on Shooting People we host a competition to find 3 films to be sent to one of our patrons. This month’s judge is Anna Higgs head of Film 4.0, Film4’s talent and ideas hub. Previously we’ve had heavy weights from all across film – commissioners, actors, directors, animators. The following 10 films are a mix of those picked by you (SP members) and those picked by us (SP staff) all equally deserving but only the top 3 will be sent to Anna Higgs for judging. The wining film will also be aired on Mubi who have an audience of 600,000 in the UK alone. Best of luck to everyone in the competition, and remember if you’re watching the films you can rate each film out of 5. ‘Homeless, A Mile In Their Shoes’ is a documentary that is spoken from the mouths of the people who have to live in the dangerous and cold streets of London. 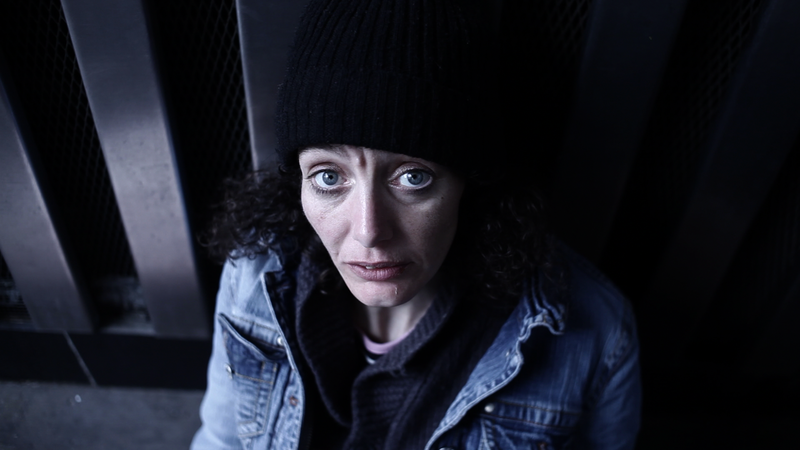 We discover first hand what the issues are behind homelessness and learn what measures are being done to help and prevent this as matters get worse in the current economic situation. I shot, edited and produced the entire film myself over a period of several months. On a larger scale my idea is to turn this short film into a worldwide collaboration between filmmakers across the globe so that we can show our audience that this is a global epidemic that needs to be addressed. With the support from Shooting People and other forward thinking people such as Film 4’s Anna Higgs will we get the right people involved. This is exactly what the industry so desperately needs: a vehicle such as Shooting People Film of the month that will open the right doors for the right people. I have to say SUNSHOWER stands out in my head not so much as a piece I directed, but as a piece I wrote. Although there are only four pages of dialogue it took me weeks to get the story arc right so that the two characters stories developed solely from their response to each other. The accident had to be both an encounter between the two characters, and also a catalyst that, in this short space of time altered the way they both understood life (and death), a gift they give to each other. I found it very hard. 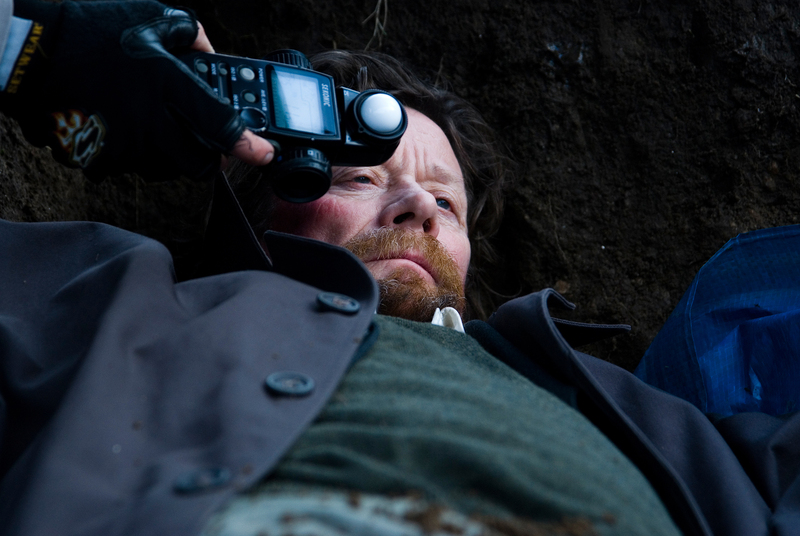 The production itself was carried out in January just outside of Dublin in the freezing cold (although it looks like it was shot in the middle of the countryside). Indeed we were incredibly lucky with the weather as It snowed heavily on either side of the four days we shot. That said standing on a mountain in the winter sunshine in all of nature’s wonder – there are worst places to be. It was fully storyboarded by me and shot by Kate McCullough on the Red One. Interestingly it was actually the first film to be shot on the Red in Ireland so it was also a bit of history I suppose. It was really Maggie (my producer) who got me this rather than me. Indeed low budget films are often about the producer doing the work and the director getting the credit. For me the performances were at the heart of the project. I was very fortunate to get the two actors that I wanted. Brendan Conroy, is one of Irelands leading character actors and Jenn Murray who is one of Irelands and the UK’s rising star. I was very flattered that the did it for the script, which, as I said, was such a struggle. Dead Man’s Lake is my Directorial debut, and written as a love letter to 80’s golden age slasher films. Using those references as the starting place for the story, our task was a simple one it seemed; setup the film with some light humour, mix in a bit of knowing absurdity and finish it with a bit of over the top horror gore. But we also knew we needed something much more than that, and what we eventually forged was a piece that played on many tropes of the genre, but then undercut it with an ending that would sharply drop the viewer back into the real world. Myself and fellow crew members are known collectively as “Bloody Cuts” (www.bloodycuts.co.uk) and we have committed ourselves to creating a series of 13 short films in the horror genre. “Dead Man’s Lake” is number 6 in the series, and was made over a rainy weekend, and for only a small amount of money. Considering the problems we had with filming, we’re proud of what we’ve produced, and hope that those who know the era of scratchy, untracked VHS tapes and the drama surrounding so called “Video Nasties” will appreciate exactly what we were trying to achieve. Because it’s the first film where I’ve taken the Director’s chair, it would be an absolute honour to be picked as part of the final 3, and one of the proudest moments of my career. Boxheads: a classic boy meets girl story. Ben – a lonely weedy character- is ignored by co-workers and friends, but then he meets love interest – Phoebe. 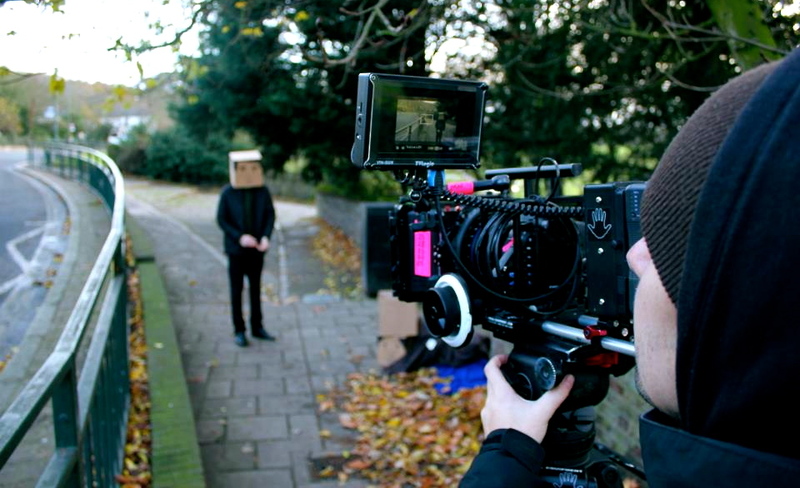 The concept behind Boxheads, written and directed by Will Nicholls, is simple: a world where everyone has a box for a head. The characters are only capable of showing simple emotions with faces that are drawn on and remain static. The reason for this is to communicate a story using restricted facial expression in an artistic and creative way. In the Boxheads universe everything has a box for a head – humans, animals, toys, pictures and drawings; all Art Directed by Georgia Shelton. We shot Boxheads, produced by Harry Cole, on a zero budget. We had a goal to use the project as a promotional video to show off the skills of the Filmmakers. We wanted everyone involved to be able to showcase their talent. Filmed by Matthew North, together we shot the film over two days in South West London, with a small but brilliant crew and a fantastic cast. Morgan Nicholls musical expertise and Chris Roebuck‘s seamless cuts finished off the piece perfectly. Although relatively new on the short film scene, we were delighted that Boxheads was runner-up in June’s Shortcutz London, and received extremely positive feedback. It is a huge achievement to be chosen as a wildcard by the Shooting People staff. We hope you enjoy our film and looking forward to hearing your comments. 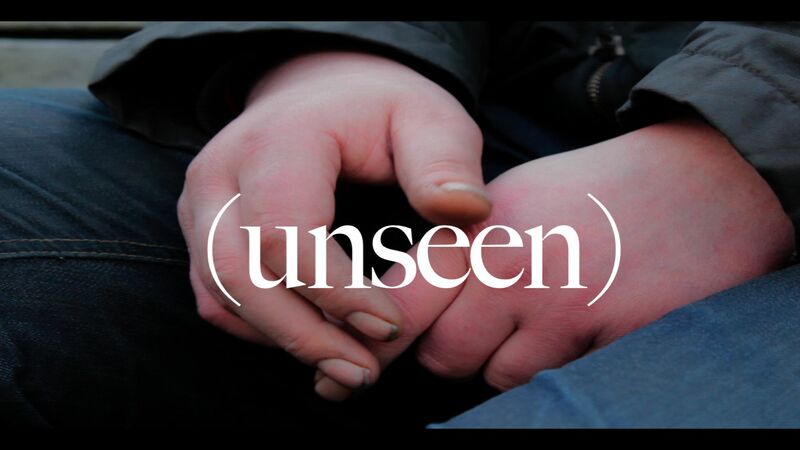 The documentary, ‘Unseen’ revolves around five fascinating individuals who were once homeless on the streets of London, and now gallantly lead the Unseen city walking tours as guides along these familiar streets. Whilst filming, I got to know the guides – Viv, Henri, Vinny, Liz and Hazel – on a more intimate level. They shared quirky and unseen aspects of iconic places in London, together with their personal, ‘unseen’ stories of sleeping rough in these areas. Charmed by all five personalities and the Unseen team, I delved deeper into the meaning they each gave their neighbourhoods, and to life per se – opening up cultural spaces on two distinct levels. My partner in crime, Martha Carvalho and I set out onto the streets, each equipped with a camera and lots of energy and enthusiasm, as we followed the guides around places like Covent Garden, Shoreditch, Brick Lane, London Bridge and Mayfair. I was puzzled upon discovering how lush Mayfair harbours homelessness, and soon after the tour- all the other promiscuous secrets that place harboured. Editing, albeit an epic task, as ever, eventually took a special life of its own. Thank you to the Shooting People community for selecting our film, and we look forward to your support in votes so we can bring this film to a larger community. Unveiling the unseen faces of homelessness, and celebrating a compassionate and creative approach to homelessness via Unseen Tours, inspires me to keep sharing more such stories, and cultures – through dialogue, through film. At midnight in a Chinatown parking lot in New York City, the underground fishing is on, the gold price is to catch an eel, for real. This is probably one of the last films I made recording on a DV tape. Shot around 2008, it now feels like is VHS, it has a vintage, lo-fi feeling to it. I encountered “Andy”, the friendly young fisherman after coming out of a circus show in downtown Manhattan late at night. He toured me around his fishing trap spots, and I immediately felt I must document it. So I asked him if I could come back and film him, he gave me his phone number, and told me he was usually there after midnight a few nights a week. I called him the following week, and arranged a shooting meeting. I asked one friend to come with me to help out and act as bodyguard if needed, after all is Chinatown after hours. Everything was shot in one night. I kept the tape in a drawer for a long time. Until one day when I was about to give away my DV camera, I reviewed this tape, and there it was this little gem. I edited the film in 2009, and applied to Werner Herzog’s first Rogue film School in LA with it, and got accepted! I just re discover it in a hard drive and decided to share it with shooting people, I am so happy and honored to have been selected for the second round, now more people will get a chance to meet the underground fishermen. I have always been fascinated by the people who fish in the East river since I arrived in New York City. Some of these fishermen do it for sports, but actually for the majority this is their daily meal, or a source of income. See how resourceful New Yorkers are to make next month’s rent. The Holiday was a few years in the making – I wrote the script whilst on a Screenwriting MA back in 2006. Having come off the course I then applied for some funding in 2008 but was told my showreel wasn’t up to scratch and I needed a short piece of drama on there. I thought the script warranted a decent production so I decided to take the advice. I then wrote the cheapest possible script I could come up with – a film called Door to Door – and shot that for my own money in 2009. Door to Door won Best Fiction Short at Festival du Film Panafricain 2010 and I also licensed it to Canal+ so it was a good experience and most definitely a learning curve. I then applied for some money to make The Holiday again and this time has better luck. We ended up making the film for much less than I had originally anticipated but had amazing support from both companies and individuals, which is how we made it work. The idea for the film came from hearing a story about a guy who was lying about having a family, and going to great lengths to back up his lies. I found it interesting and started wondering if creating a fictitious life as a coping mechanism could have benefits. It’s quite a creative way of trying to deal with a life you simply can’t bear, and fiction can be such a great escape – watching a really absorbing film in a cinema is like taking a short holiday. Perhaps pretending is the next best thing to the real deal. But escaping into fiction is not always a good option obviously, and The Holiday ended up quite a sad little story. I’d say it’s a film about a character who, in quite a deluded way, is trying to make the best of things, and that’s not necessarily a bad thing. 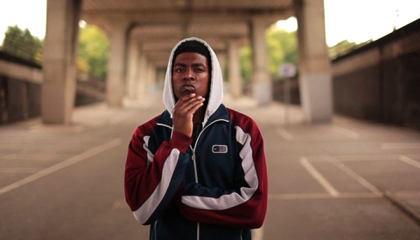 Hoodie Monologue came about in 2011 when Director David Hewitt and Producer Amy Mathieson were already working on a project featuring the youth of London. Whilst travelling to a location, Amy was on the underground and spotted Adrian rapping. She asked him for his details on the hope that we might be able to work together on something. Then, the four days of rioting happened across the UK. The riots, looting and fires took the attention of the press, media, social commentators, bloggers, politicians, local community people and obviously the police. Everyone had their opinions on what caused the unrest and many lined up to publicly condemn them. The riots passed, those with voices had had their say and now the UK could get back to where it was before. Job done. But there was one voice, which was not largely represented in the media; the young person and maybe the voice of a ‘hoodie’. We chatted to Adrian and decided to make a film, which expressed this opinion. We discussed structure and length and then Adrian wrote his monologue. We filmed where the furniture shop had burned down in Croydon and then other locations such as Scotland Yard and the Houses of Parliament. We shot it in one day, handheld and quick. The only budget was to buy what we ate during the shoot. I salute Adrian for writing excellent lyrics and for delivering a passionate performance. From a director’s point of view, I wanted to keep it raw,simple and for the filmmaking to be restrained from too much complexity. I hope you enjoy the film and I hope that you appreciate that there is a difference between opinion and fact. All opinions are valid; especially the ones we are not used to hearing. 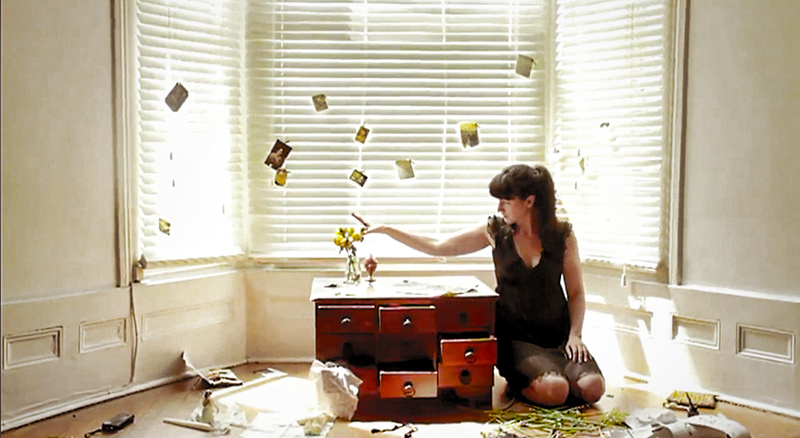 Filming poetry can be a tricky thing – the words are often so crafted that whatever image you put with them is either too literal or so vague as to be meaningless. We tried here with “Fading Colours” to mix the abstract and the literal, and played with some simple visual metaphors for the emptiness of feeling lost and the clutter of memories. Wanky as that may sound, we didn’t sit cross-legged wearing berets and draw out some kind of complex arty mind-map of where everything should be and what it all meant: the shoot was largely improvised, as we unpacked the various items into the space and saw what happened. We didn’t have specific bits of text in mind when shooting each section so it was an interesting jigsaw in the edit. I think there’s something intriguing in finding oneself looking through the different objects with Lucinda, not knowing what they are, or even who she’s addressing through the words. As a “short”, it’s too long, for sure: I get carried away with the visuals, and with Lucinda’s honest performance I felt like I didn’t want to just rush to an end point. But I think if you’re feeling in an ambient mood, it takes you somewhere. Hopefully somewhere interesting.